Click the logo to view the Rother Valley web site. A new website for breeders and puppy buyers. 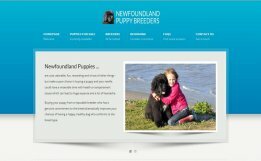 The purpose of this web site is to put potential Newfoundland puppy buyers in touch with reputable and recognised breeders by steering them away from general online puppy sites (e.g. Epupz). 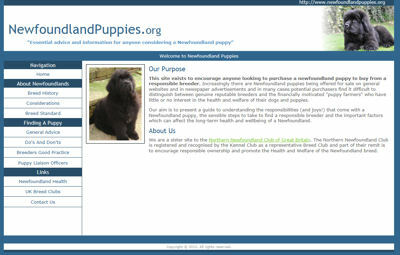 Our sister web site specifically intended to educate and inform potential purchasers of a Newfoundland puppy. We hope the site will assist in guiding people away from the dreadful 'puppy farmers'. Our Club, of which we are very proud. We haven't provided a link as you are here already! Established in 1886, the Newfoundland Club is one of the oldest KC registered Breed Clubs in the UK and is acknowledged worldwide as laying the foundations for the breed standard and type for Newfoundlands. The UK's newest KC recognised Breed Club, the SNC was formed in 2008 and has an award-winning web site with great content and photographs, regularly updated. Whilst not affilated to the Kennel Club, the Scottish club is very active in working Newfoundlands and in addition arranges fun days, fund-raising events and a Companion Dog Show. Founded in 1958 the Club is active in promoting the breed in Ireland hand organises a full range of activities. Now affiliated to the Kennel Club, the Emerald Isle Newfoundland Club operates in Northern Ireland and the Irish Republic. A mine of important information and advice about all aspects of health relating to Newfoundlands. Topics covered include both simple and complex ailments through to the most prominent diseases found in the Newfoundland breed. Always up-to-date with the latest UK show results and much more, this site is an invaluable free resource for Newfoundland enthusiasts. A massive database of Newfoundland dogs with pedigrees and lots of photographs going back many years. Scuola Italiana Cani Salvataggio web site also available in English language. A web site for the group of friends who work with their Newfoundlands to raise money for childrens charities. The Northern Newfoundland Club take no responsibility for the content, accuracy or validity of any third party web sites which are linked from this page.